Call a bathroom expert on 0330 053 6040. 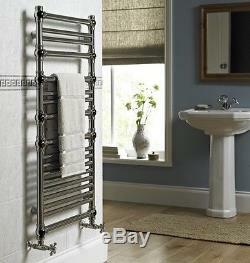 Vogue LG018 Penthouse Vertical Radiator Electric Central Heating Chrome Finish. Vogue LG018 Penthouse Vertical Radiator Electric Central Heating Unit. Wall brackets are included, feet and other fixing accessories are not included. We do NOT deliver to the following: Scottish Islands, Ireland, HS, KW, ZE. Scotland, Northern Ireland, Isle of Man, Isle of White, PO30-41. For larger items please refer to listings for more detailed information regarding deliveries. We use recognised carriers and all deliveries are trackable. Our products are fully supported with manufacturers warranties. All the prices quoted on this site include VAT. Bathshop321 Big Storage Earl Road Handforth Cheshire SK8 6PT. Call our bathroom advisors on 0330 053 6040. You must take reasonable care of the goods and immediately reurm them at your own expense. About these Terms and Conditions. These terms and conditions are in place to protect you and Bathshop321. How The Contract Is Formed Between You And Us. Please note that this does not mean that your order has been accepted. All orders are subject to acceptance by us. The contract between yourself and Bathshop321 will only be formed when we dispatch your items. 2.2 The Contract will relate only to those Products we dispatch to you. We will not be obliged to supply any other Products which may have been part of your order until those Products become available to us for dispatch. By placing an order through our website, you agree that. You are legally capable of entering into binding contracts; and. You are placing your order from within the UK. Please see clauses 10, 11, 12 and 13 for further info. You have a legal obligation to take reasonable care of the Products while they are in your possession. If you fail to comply with this obligation, we may have a right of action against you for compensation. 4.3 You will not have any right to cancel a Contract for the supply of any Products. I That have been custom made to suit your specifications. Iv If you have bought the item(s) in a professional capacity in line with your usual business i. 4.4 Details of this statutory right, and an explanation of how to exercise it, are provided in the Dispatch Confirmation. This provision does not affect your statutory rights as a consumer. 5.1 Deliveries are made by an external professional logistics company. To fulfil your order you will need to provide the courier company with your personal details, name, and address and telephone number. If you do not receive this please do not hesitate to contact one of the team on 0330 053 6040. The driver is not insured to take the goods inside your property. Invariably we will contact you to confirm any subsequent changes. Please make sure your contact details are correct at the time of placing your order. 7.1 We are confident that you will be delighted with your goods. Checking Goods for Damage and Notifying Bathshop321. 8.3 If someone else is signing for the goods on your behalf you agree to advise them that the goods must be checked and you accept full responsibility for any loss or damage if they sign on your behalf and fail to check. Talk to our experts first! We may be able to work with you to resolve the issue. 10.3 If you decide to return goods after they have been delivered; it is your responsibility to arrange this return at your own cost, we can help coordinate this procedure on request. 11.1 By placing an order with us, you agree to check all goods upon arrival and notify us within a reasonable time of the error. Immediately and we will investigate the problem. If it is found that products are incorrect or missing the situation will be rectified as quickly as possible with no additional charges incurred by you. 12.3 Where possible you may need to provide. Of the damage/fault and this will help us to assess the best course of action. Faulty items will be assessed on a case by case basis we will notify you as soon as practicably possible of the result. We aim to work through this with you. Pricing errors and genuine mistakes. 13.1 The price of any Products will be quoted on our website, except in cases of obvious error. 13.4 Our site contains a large number of Products and it is always possible that, despite our best efforts, some of the Products listed on our site may be incorrectly priced or have the incorrect information. Where a Product's correct price is less than our stated price, we will charge the lower amount when dispatching the Product to you. If a Product's correct price is higher than the price stated on our site, we will either contact you for instructions before dispatching the Product, or reject your order and notify you of such rejection. 13.5 If the pricing error is obvious and unmistakeable and could have reasonably been recognised by you as an error, we do not have to provide the Products to you at the incorrect lower price. Applicable laws require that some of the information or communications we send to you should be in writing. When using our site, you accept that communication with us will be mainly electronic. For contractual purposes, you agree to this electronic means of communication and you acknowledge that all contracts, notices, information and other communications that we provide to you electronically comply with any legal requirement that such communications be in writing. This condition does not affect your statutory rights. 15.2 The provisions in clause 15.3 shall only apply if you are contracting as a business and not as a consumer. 15.3 Subject to clause 15.6. We shall under no circumstances whatever be liable to you, whether in contract, tort (including negligence), breach of statutory duty, or otherwise, for any loss of profit, or any indirect or consequential loss arising under or in connection with the Contract; and. 15.5 In the event of us agreeing to reimburse you for the costs of reinstallation (for instance, if we determine that the Product in question was defective when installed but such defect may not have been clearly apparent to you or your plumber or other installer) then such reimbursement is limited to your plumber or other installer's reasonable costs, which may be determined with reference to normal industry levels at the time in question. 15.6 Nothing in these terms and conditions shall limit or exclude our liability for. Death or personal injury caused by our negligence, or the negligence of our employees, agents or subcontractors (as applicable);c.
Breach of the terms implied by section 12 of the Sale of Goods Act 1979. Defective products under the Consumer Protection Act 1987; or. Any matter in respect of which it would be unlawful for us to exclude or restrict liability. 16.1 We will not be liable or responsible for any failure to perform, or delay in performance of, any of our obligations under a Contract that is caused by events outside our reasonable control (Force Majeure Event). 16.2 A Force Majeure Event includes any act, event, non-happening, omission or accident beyond our reasonable control and includes in particular (without limitation) the following. Strikes, lock-outs or other industrial action. Civil commotion, riot, invasion, terrorist attack or threat of terrorist attack, war (whether declared or not) or threat or preparation for war. Fire, explosion, storm, flood, earthquake, subsidence, epidemic or other natural disaster. Impossibility of the use of public or private telecommunications networks. The acts, decrees, legislation, regulations or restrictions of any government. Or any other event that constitutes as an act of God. 16.3 Our performance under any Contract is deemed to be suspended for the period that the Force Majeure Event continues, and we will have an extension of time for performance for the duration of that period. We will use our reasonable endeavours to bring the Force Majeure Event to a close or to find a solution by which our obligations under the Contract may be performed despite the Force Majeure Event. 17.1 If we fail or delay, at any time during the term of a Contract, to insist upon strict performance by you of any of your obligations this does not mean we have given up our rights and we may still require you to comply with your obligations under the Contract. 17.2 If we forgive (in writing) any particular default by you of your obligations under a Contract, that does not forgive any subsequent default by you. If any of these terms and conditions or any provisions of a Contract are determined by any competent authority to be invalid, unlawful or unenforceable to any extent, such term, condition or provision will to that extent be severed from the remaining terms, conditions and provisions which will continue to be valid to the fullest extent permitted by law. 19.1 We intend to rely upon these terms and conditions and any document expressly referred to in them in relation to the subject matter of any Contract. While we accept responsibility for statements and representations made by our duly authorised agents, please make sure you ask for any variations from these terms and conditions to be confirmed in writing. Our Right to Vary These Terms And Conditions. Any dispute arising from, or related to, such Contracts shall be subject to the non-exclusive jurisdiction of the courts of England and Wales. We are not responsible for indirect losses which happen as a side-effect of the main loss or damage and which are not foreseeable by you and us (such as loss of income or revenue, loss of business, loss of profits or contracts, loss of anticipated savings, waste of management or office time). If you are in any doubt, just call one of our specialist bathroom. Open 7 days a week. A wide range of bathroom products to explore at the highest quality. Big Storage Earl Road Handforth Cheshire SK8 6PT. The item "Vogue LG018 Penthouse Vertical Radiator Electric Central Heating Chrome Finish" is in sale since Monday, February 27, 2017. This item is in the category "Home, Furniture & DIY\Heating, Cooling & Air\Radiators". The seller is "bathshop321co" and is located in Heywood. This item can be shipped to United Kingdom.